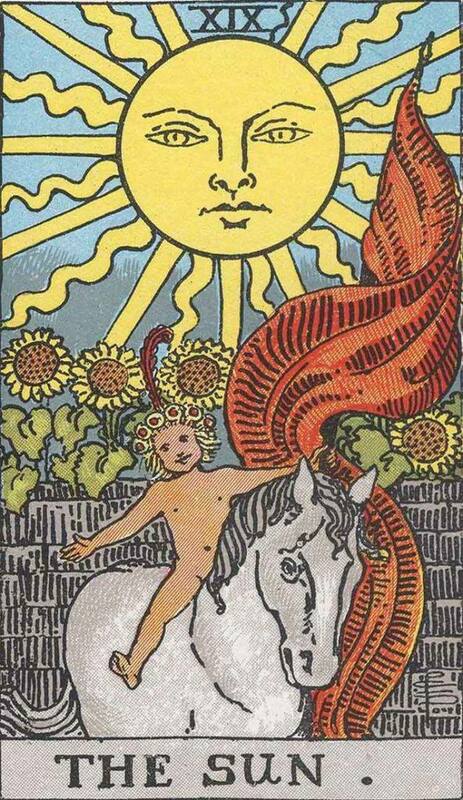 The Sun is the 19th Major Arcana card. The Sun is a well known tarot card, and a positive sign wherever it lands. Widely regarded as one of the most positive cards in the deck; as soon as you see it drawn, you should feel relief. In many mystic circles, The Sun is known as a masculine entity, partner to The Moon. The Sun brings optimism, joy and enthusiasm to your life. Past – The Sun in the Past position means that you’re coming out of a really good phase of your life. Don’t treat it as it’s over, treat it as a good foundation to work from. If you think of your body as a building, say, a temple, it must have good foundations both physical in actual construction, and good foundations in morality, truth and selflessness. Present – The Sun in the present position represents a good period of time that you’re about to enter, or are currently residing in. Get ready for new opportunities and new people. You may feel extremely calm right now and fulfilled, like nothing can get to you. It’s a feeling we all strive for. Congratulations. Future – The Sun in the future position represents the feeling of fulfilment that you will have when you have completed what you’re working on. Apathy is death, but to strive to achieve is to live. Work / Education – The Sun in regards to work or education means that a new job may be right around the corner. Generally, things are going to go well. Don’t worry about work. It’s like it’s all being taken care of. Not to say there is no effort on your part, but previous fears and worries relating to work and school will disappear. Romance – The Sun in romance is a good sign if you’re in a relationship. You’ll discover new things about each other and reach new levels. Don’t expect conflict now, but if it happens, you can get through. If you’re single, however, it might be worth staying single for a while longer. Be free and explore yourself. Friends – The Sun in regards to friendship might mean that its time to take things back to basics. Are things getting stagnant with your friends? Do something simple. Play a game together or go visit a new attraction or town. Do something mindless, but fun. Not everything has to be over analysed. Money – The Sun means money is likely to be better off now than it was in the past. Things are looking good. your money has the potential to go a long way. Giving to charity now would be a good thing to do. Donate some old possessions or put some time in for a community project, especially if you haven’t tried either of these things before. Health – The Sun in health means you should be in top condition. Enjoy yourself while you’re at a high point. Don’t get discouraged and think it can’t get any better, it can! But don’t keep working all your life. Enjoy yourself. Spirituality and Mentality – The Sun in spirituality means you might take on a whole new worldview, if only temporarily. It will be like you’re seeing the bigger picture or from multiple angles. Talk to other people about how you feel, and listen to them too. In reverse, The Sun can take on some darker aspects. If you are feeling content right now, is it justified? Are you only content and happy because somebody else is feeling sad? Make sure you aren’t taking advantage of anybody. The Sun in reverse may also mean a peaceful period is going to come to an end soon. Be aware of it, as things may soon get turbulent. We’ve selected live tarot readers to give you a FREE 3 Minute interpretation of the Sun! Scroll through them below and pick your favorite one.